[Corset 3] This corset it the Angel Underbust pattern from Scarlett! Don’t you just love those lines! This is my first corset with hip gores 🙂 And I love it! [Corset 4] This pattern is also a little roomy on me, but it does make for a very comfortable wearing corset! And I love the shape of the top of this corset- perfect for making a matching bra! Emerald Erin’s corset making started in October 2015 when she decided to not just review my corset making course but do a whole ‘Corset October’, swapping out her ‘bra-a-week’ for corsets for the month. So in the space of a month Erin made her first, second, third and fourth corsets! The first two were made from a Pin-Up Girls pattern and the third and fourth were my Angel and then Harlot corset patterns. Phew! I felt tired just reading her blog! Big love to Gibby her pooch! 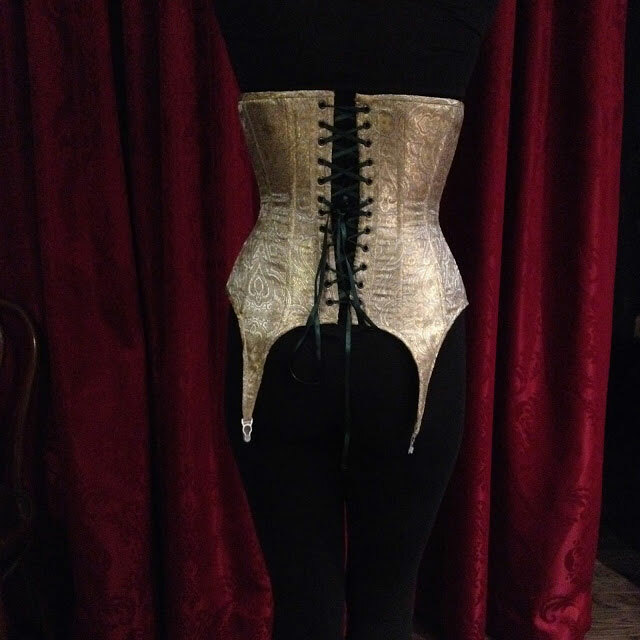 “[Corset 1] I love how this turned out! I used a solid colour pinky-peach for the side and back, and the same colour fabric that has a flower print texture on the front for more interest. I also used the textured fabric to bind the top and bottom. Both of these fabrics are heavy-weight drapery fabrics from Fabricland, and underneath they are lined with a heavy weight cotton corset twill. Emerald Erin’s corset making started in October 2015 when she decided to not just review my corset making course but do a whole ‘Corset October’, swapping out her ‘bra-a-week’ for corsets for the month. So in the space of a month Erin made her first, second, third and fourth corsets! The first two were made from a Pin-Up Girls pattern and the third and fourth were my Angel and then Harlot corset patterns. Phew! I felt tired just reading her blog! I am so thrilled with how this corset turned out! I feel so pretty in it! I’ll have to get used to the feeling of being corseted, and I’ll definitely have to make an outfit to go with this! [Corset 2] Because you’re not supposed to use lightweight fabrics for the outside of a corset, I used a double sided adhesive interfacing (Wonder Under) to fix it to the lining- which turned out a little heavier than I would have liked, I think in the future I would just keep them as separate layers and use an interfacing on the rayon.